There is a reason why the Indian cricket team won the World Cup and then lost the One Day International series in England in the space of a few months, the same reason why India’s best performance in a Commonwealth Games came in Delhi in 2010. It’s called home advantage. Two sportsmen are going to uncover this mystery of home advantage (or is it disadvantage?) soon. Race drivers Narain Karthikeyan and Karun Chandhok are in with a chance to race at home when the inaugural F1 Indian Grand Prix (GP) is held in Greater Noida, near Delhi, from 28-30 October. Karthikeyan, who races for HRT-Cosworth, has started eight times this season, with the European GP in June being his last race, though he is likely to enter in India. “As a driver, it will be an unparalleled experience, driving in front of the home crowd," says Karthikeyan. “I’ve experienced a little bit of that while driving in Durban in A1GP, where there’s a huge Indian population. With over 100,000 people cheering me on here, I’m sure it’ll be worth some lap time. “Support from the crowd would be a huge motivating factor but I would be lying if I say that there won’t be pressure to push the envelope as far as my performance is concerned," he adds. 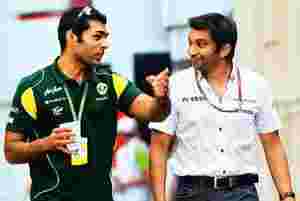 Team Lotus owner Tony Fernandes told Reuters on Monday that he would like Chandhok to race in India, but the final decision would be taken by the team management. Chandhok is the Lotus-Renault reserve driver, and has raced once this season after replacing Italian Jarno Trulli at the German Grand Prix in July. Fernandes said the Italian would most likely step down if Chandhok was given preference. “I have never raced in an international series in India, so if I do get to race in front of my home fans, it will definitely be unfamiliar territory for me," says Chandhok. “But one thing is for sure— the cheer from fans will play a huge role in motivating me. When I won at Spa in GP2 in 2007, our national anthem was played at an F1 weekend for the first time ever and I will never forget that." To an extent, the advantage of racing in India will be nullified for the two racers because the track would be new for everyone. As Chandhok and Karthikeyan point out, since all teams use simulators to learn circuits, the track holds the same mysteries for all drivers. “But I am hoping the crowd support will give me a tenth or two of a second if I do race," says Chandhok. The presence of both Karthikeyan and Chandhok is critical to the success of the race in India, though it can be argued that the country had a fan base for the sport much before the Indian GP was announced. The sport’s popularity has also increased since Karthikeyan became the first Indian ever to enter F1 in 2005. The supporting figures are telling: The 2010 season of F1 reached out to 24.7 million consumers in India, while this year 22.5 million people have already tuned in for the first 11 races, according to Rathindra Basu, senior director, corporate communications, business development and event management group, ESPN Software India Pvt. Ltd.
Television viewership apart, the presence of the two Indians, F1 watchers say, will help boost ticket sales. Vicky Chandhok, Karun Chandhok’s father and president of The Federation of Motor Sports Clubs of India (FMSCI), cites the example of Spain. Before Fernando Alonso came along, says Vicky, the attendance for races held in Barcelona ranged between 50,000-60,000 people. After Alonso won the Championship, this number doubled to 120,000 people for the Spanish GP. At the pre-season testing earlier this year, 40,000-50,000 people attended the tests just because of Alonso. Spain also hosts two races on the F1 calendar. “That just proves how much driver power can increase attendance figures," says Vicky. “We are hoping our drivers can have the same effect here as well. For any host country, to increase ticket sales it is important to have a local driver on the grid; if there are two drivers, even better. The Indian GP will be a bigger success if it has an Indian driver on the grid." For Karthikeyan, the concern at the moment is different: “Competing in my home Grand Prix—it should make for a surreal experience," he says.